Click here to see a slide show presentation and read more about The Downtown School. Based on current research and proven educational practices that are responsive to the changing needs of the community, the Downtown School will provide a multi-age elementary experience. The Downtown School, in collaboration with parents and the business community, will provide a diverse, experience-based learning environment that ensures each child’s success. 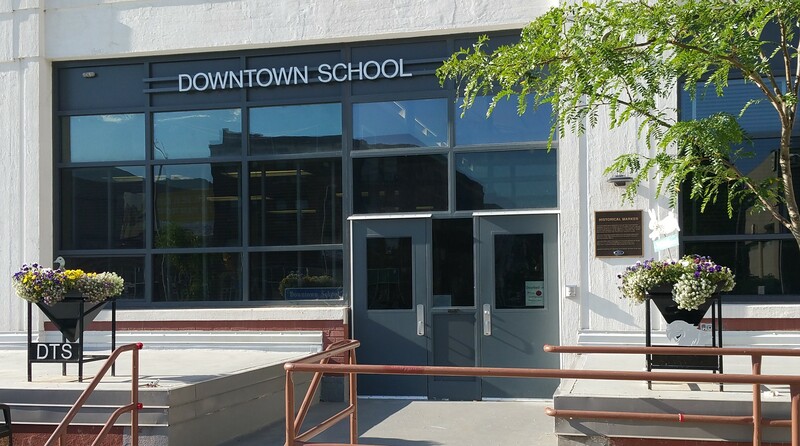 The Downtown School is a place where students learn – – unencumbered by desks, grade levels, or the limited information between the covers of a textbook. The Downtown School provides an educational experience based on what research has shown to be the best practices in elementary education. Small Class Size – Classes average between sixteen and eighteen students. This allows teachers to design and implement lessons specifically suited to the needs of individuals. Integrated Curriculum – Traditional subjects are integrated and focused on themes. Students learn and practice subject-area skills in authentic problem-solving situations. Multi-age Classes – Each class includes students whose ages span two or more years, enhancing social and academic growth. Experience-Based, Active Learning – Teachers create an environment that encourages children to learn by doing. Students then share their learning with the class. Year-Round Calendar – Downtown School has a six-week summer break and four week-long breaks throughout the school year. Three-Way Conferences – Students, teachers and parents review accomplishments and develop goals for the student, during student-led conferences three times a year. Assessment – Individual student portfolios are maintained to benchmark progress and share at conferences. Rather than grades, teachers use narrative to describe growth in academic and social activities. In addition to traditional standardized testing, performance-based tests are used to assess student achievement. Parental Involvement – The downtown location is convenient for working parents to keep in touch with their child and strengthens communication with educators. Activities are often scheduled during the lunch hour to make it convenient for parents to play an active part in classroom-related activities and committees for the school. Parents are encouraged to visit their child during the day – many stop by over lunch. Parental involvement is key to the success of individual children and the Downtown School.